Members of the River Valley wrestling team pose for a picture after winning the Division III Region 22 team championship on Saturday at Nelsonville-York High School in Nelsonville, Ohio. NELSONVILLE, Ohio — That’s quite a first impression. 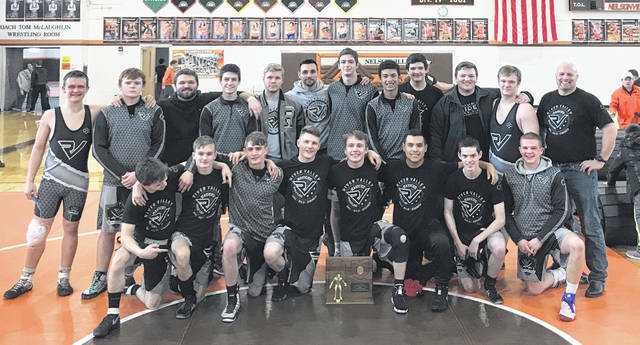 In its first season with a full roster, the River Valley wrestling team made a bold statement after winning the Division III, Region 22 team title on Saturday at Nelsonville-York High School in Athens County. The Raiders — who started the head-to-head event ranked fifth in the 15-team field — posted a perfect 4-0 mark as a team while accumulating a 36-20 record individually. The Silver and Black had a pair of comfortable victories over 12th ranked Trimble (60-21) and 13th ranked Alexander (60-18) in the opening rounds, then held off ninth ranked Amanda Clearcreek in the semifinals by a 43-31 margin. In the Region 22 championship dual, the Raiders joined third ranked Bishop Hartley in winning seven of the 14 individual weight classes — but River Valley ultimately claimed the regional crown with a 42-36 decision. In winning the Region 22 title, the Silver and Black are now headed to Columbus next weekend to compete for the OHSAA Division III championship at St. John’s Arena. For RVHS coach Matthew Huck, this accomplishment was the culmination of a lot of hard work in building the program up for two decades. Now, in his 20th season at the helm, Huck acknowledges that this arguably the proudest moment of his tenure — which is the exact same sentiment that most of his troops left with on this afternoon. And, there’s still another goal out there waiting for them. The Raiders went 10-4 in individual matches against Trimble and were 11-3 overall versus Alexander, then posted an 8-6 mark against Amanda Clearcreek in the semifinal round. River Valley had five grapplers — Joseph Burns (113), Jacob Edwards (120), Seth Bowman (132), Nathan Cadle (138) and Eric Weber (182) — go unbeaten in four rounds of competition. Cadle led RVHS with four pinfall wins, while Edwards, Bowman and Weber each scored two pinfalls. Burns also landed a pinfall victory. Will Hash (145), Brice Petitt (195) and Christopher Goheen (285) all went 3-1 in their respective divisions. Hash and Goheen both earned a pair of pinfall wins, while Petitt had a single pinfall victory. Levi Roberts (106) and Nathan Brown (152) both went 2-2 overall, while Derek Johnson (160), Aiden Greene (170) and Ryan Weber also had a win apiece in four bouts. The other Division III regional champions that will compete with RVHS for a state title next weekend were Milan Edison (Region 17), Genoa Area (R18), Crestwood (R19), Rootstown (R20), Pleasant (R21), Blanchester (R23) and Versailles (R24). The Division III OHSAA team championships will begin at 11 a.m. Sunday at St. John’s Arena on the campus of Ohio State University. Gallia Academy also competed in the Division II, Region 14 team championships held at Miami Trace High School. The Blue Devils were defeated 45-22 in the opening round by Washington Court House, posting only four wins in the 14 head-to-head matches. Garytt Schwall (106), Jason Stroud (120), Dakota McCoy (138) and Bronson Carter (152) came away with Gallia Academy’s lone victories. Schwall, McCoy and Carter each had a pinfall win, while Stroud posted a 12-4 major decision. Visit baumspage.com for complete results of the 2019 OHSAA Regional Team championships held Saturday throughout the Buckeye State.